This page is not meant to be a lecture on the evils of owning a gas guzzing SUV, nor to chastise one for warming up the family station-wagon before an outing. Hopefully, this page will be a reminder that certain actions we do every day can have long-reaching results. If each of us will take just a few minutes, there will be fewer preventable over exposures, burns, and poisonings. And perhaps with a small bit of effort, our children will have a little bit better future. Keep your home clean. Allergies and asthma attacks can be brought on by pet dander, dust mites, pollen, molds, and secondhand smoke. Don't smoke in your house or car. Don't let others either. Adding upgraded air filtration to your forced air heating system will help control many IAQ issues. Walk wherever possible. Take the bus. Use carpools. No open outdoor refuse burning. Don't idle your car for extended periods of time. Keep aware of high pollution warning days. Limit your children's outdoor activities on those days. Always store poisons, pesticides, and chemicals out of children's reach, preferrably in a locked shed, where children do not have access. Don't store chemicals in containers that look like food or drink containers. Keep trash and food storage in sealed containers to keep out pests. Always wash fruits and vegetables. Remove peel or rind whenever possible. Place any mouse or rat traps and baits where children cannot reach find them. Read and follow toxic chemical directions carefully. Keep children, pets, and toys away from areas where pesticides have recently been applied. Have your children tested for lead exposure. Test your home for lead paints, if your home was constructed before the late 70's. Use only cold water for making baby formula or for drinking. Insist your children wash their hands well before meals. Good habits now can last a lifetime. Wash pacifiers and baby bottles often. In older homes assume there are lead paint contaminants. Wash window sills and floors to keep the dust and peeling paint under control. Call in a radon mitigation expert if levels exceed 4pCi/L. This level is recommended by the EPA (Environmental Protection Agency) . We recommend action if the level is half that. Have all furnace vents, flues, chimneys, and gas-fired appliances inspected and adjusted once per year. 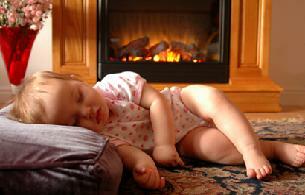 Do not use kerosene heaters or unvented gas heaters in a bedroom. Do not idle cars, lawn mowers, generators, etc., in the garage. Never use BBQs in the garage or inside the home. Don't use ovens or gas cooktops for space heating. Many a life has been saved by CO detectors. Install one in each bedroom. 1) Call your public water supplier for their annual water quality reports. 2) Recycle used motor oil. Keep away from small hands. 3) Protect your children from the effects of overexposure to the sun. Wear sunglasses, protective clothing, and use an SPF 15 or better sunblock. Infants should not be in direct sunlight. 4) Limit your children's mid-day sun exposure. Between 10 am and 4 pm is worst time. 5) Never eat fish rumored to have high levels of mercury. Do not allow children to handle or play with mercury.